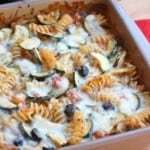 Easy, healthy and delicious vegetarian baked pasta with zucchini, cottage cheese and tomatoes will please even picky eaters. Preheat the oven to 350F degrees. Lightly spray a 9-inch square baking dish with nonstick cooking spray and set it aside. Prepare the pasta according to the package instructions. Drain and return to the pasta pot. Add the cottage cheese, Italian seasoning, garlic powder, parsley flakes, zucchini, tomatoes and olives. Stir until well combined. Spread the pasta mixture evenly into the prepared baking dish. Sprinkle evenly with the Parmesan and mozzarella. Remove the foil and bake until the top begins to brown lightly, 5 to 10 minutes.